“Dead and alive at the same time? Researchers at the Max Planck Institute of Quantum Optics have implemented Erwin Schrödinger’s paradoxical gedanken experiment employing an entangled atom-light state. In 1935 Erwin Schrödinger formulated a thought experiment designed to capture the paradoxical nature of quantum physics. The crucial element of this gedanken experiment is a cat that is simultaneously dead and alive. Since Schrödinger proposed his ‘cat paradox’, physicists have been thinking about ways to create such superposition states experimentally. A group of researchers led by Gerhard Rempe, Director of the Division of Quantum Dynamics at the Max Planck Institute of Quantum Optics, has now realized an optical version of Schrödinger’s thought experiment in the laboratory. In this instance, pulses of laser light play the role of the cat. The insights gained from the project open up new prospects for enhanced control of optical states, that can in the future be used for quantum communications. “According to Schrödinger‘s idea, it is possible for a microscopic particle, such as a single atom, to exist in two different states at once. This is called a superposition. Moreover, when such a particle interacts with a macroscopic object, they can become ‘entangled’, and the macroscopic object may end up in superposition state. Schrödinger proposed the example of a cat, which can be both dead and alive, depending on whether or not a radioactive atom has decayed – a notion which is in obvious conflict with our everyday experience,” Professor Rempe explains. In order to realize this philosophical gedanken experiment in the laboratory, physicists have turned to various model systems. The one implemented in this instance follows a scheme proposed by the theoreticians Wang and Duan in 2005. Here, the superposition of two states of an optical pulse serves as the cat. The experimental techniques required to implement this proposal – in particular an optical resonator – have been developed in Rempe’s group over the past few years. 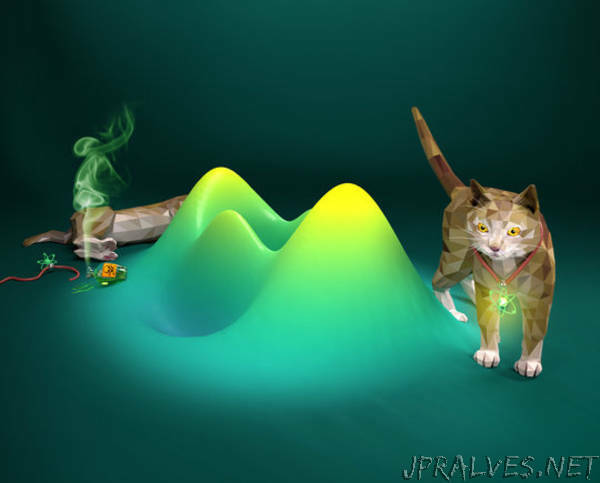 The researchers involved in the project were initially skeptical as to whether it would be possible to generate and reliably detect such quantum mechanically entangled cat states with the available technology. The major difficulty lay in the need to minimize optical losses in their experiment. Once this was achieved, all measurements were found to confirm Schrödinger’s prediction. The experiment allows the scientists to explore the scope of application of quantum mechanics and to develop new techniques for quantum communication. The laboratory at the Max Planck Institute in Garching is equipped with all the tools necessary to perform state-of-the-art experiments in quantum optics. A vacuum chamber and high-precision lasers are used to isolate a single atom and manipulate its state. At the core of the set-up is an optical resonator, consisting of two mirrors separated by a slit only 0.5 mm wide, where an atom can be trapped. A laser pulse is fed into the resonator and reflected, and thereby interacts with the atom. As a result, the reflected light gets entangled with the atom. By performing a suitable measurement on the atom, the optical pulse can be prepared in a superposition state, just like that of Schrödinger’s cat. One special feature of the experiment is that the entangled states can be generated deterministically. In other words, a cat state is produced in every trial. “We have succeeded in generating flying optical cat states, and demonstrated that they behave in accordance with the predictions of quantum mechanics. These findings prove that our method for creating cat states works, and allowed us to explore the essential parameters,” says PhD student Stephan Welte. “In our experimental setup, we have succeeded not only in creating one specific cat state, but arbitrarily many such states with different superposition phases – a whole zoo, so to speak. This capability could in the future be utilized to encode quantum information,” adds Bastian Hacker, who is also a doctoral student at the Institute. “Schrödinger‘s cat was originally enclosed in a box to avoid any interaction with the environment. Our optical cat states are not enclosed in a box. They propagate freely in space. Yet they remain isolated from the environment and retain their properties over long distances. In the future we could use this technology to construct quantum networks, in which flying optical cat states transmit information,” says Gerhard Rempe. This underlines the significance of his group’s latest achievement.